Humanity? Sigh…a pride of lions which preyed on and devoured others, usually more docile animals, would have ‘tender’ moments with members of the pride. What is the difference. Have you watched the ‘God Father’ movies? You don’t know the meaning of humanity, IMO. I’m a hopeless optimist for better or for worse. I’d like to believe we all have a degree of humanity. Perhaps looking back, he may have felt he could have done differently, perhaps not. But thanks for your viewpoint. Certainly food for thought. You don’t know the man. That’s obvious. Lee Kuan Yew is a human first, a leader next, who in his successful calling in the inseparability of mission and life, is like the masterpieces of Van Gogh, and Mozart. His kind of leadership is based on humaness. He has created a template for future governance for countries of the world. Taking the good of Theocracy, Communism and Democracy- Knucle Duster Democracy is the democracy of Gods, and in my eyes he is a one of the greatest that live. In his hour of sadness, my heart bleeds with his, and for his late wife and surviving kin who are equally pained in their seperation,and who is herself beyond tribute, of any daughter, wife and mother. Thank you for your site, I came upon accidentaly, that allows me to express my true feelings. Thanks Anon – you’re right that I don’t know him but I’d like to think that some of what I wrote, if not all is true. Did you know him personally? If you did, you probably are privy to more than I am, granted. Srirekam Jay, thanks for your point of view. I do agree with your view on taking the good of theocracy, communism and democracy. I’m sure the family appreciates your heartfelt condolences. Sorry I just saw this now, but I am one with you in sharing condolences. I think Mr. Lee Kuan Yew is not perfect. Sure, there may be some thing to be said of his regime, but he did accomplish a vision that let his countrymen be stirred into completing it until now. 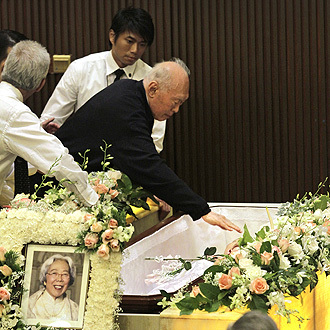 It is said that Singapore’s greatest asset is its people and that was part of Mr. Lee Kuan Yew and his wife’s hearts. Nice comment there and we are in agreement!